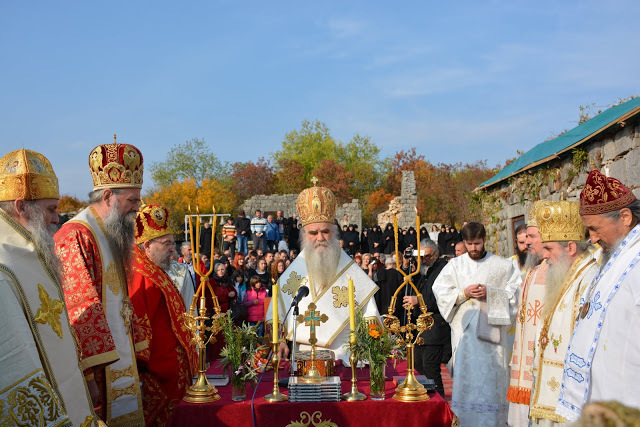 With the Holy Hierarchical Divine Liturgy in the Saint's birthplace of Kornet in the Ljesani county on November 15, 2015 the first liturgy in commemoration of St. Mardarije of Ljesani-Libertyville and All-America was served in the Metropolitanate of Montenegro and the Coastlands. 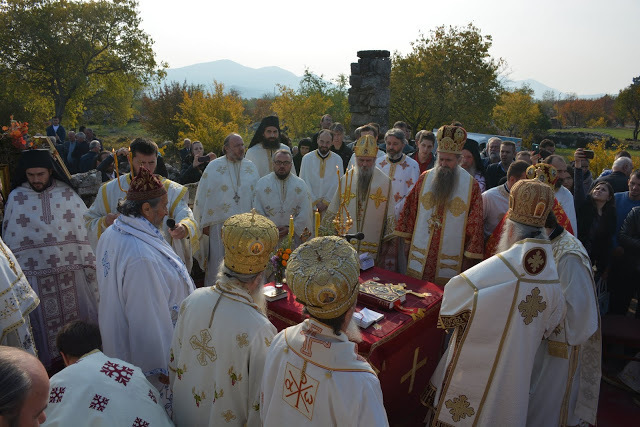 Officiating at the liturgy at the ruins of the ancient monastery and birthplace of St. Mardarije was Archbishop of Cetinje and Metropolitan of Montenegro and the Coastlands His Eminence Amphilohije, with the con-celebration of Bishop Lukijan of Budim, Bishop Atanasije of Bihac-Petrovac, Bishop Joanikije of Budimlje-Niksic, Bishop Joachim of Polos-Kumanovo, Bishop Jovan of Pakrac-Slavonia and Bishop Atanasije, reitred bishop of Hercegovina, together with many clergy of our local Church. Responding at the liturgy were the seminarians from the St. Petar of Cetinje Seminary and members of the "St. Stanko the New Martyr" Choir from Niksic, and prayerfully participating at the liturgy were the faithful who gathered from throughout Montenegro. In the liturgical sermon after reading the Holy Gospel Bishop Atanasije said that God in Trinity is rich in the holy ones. He reminded the faithful of the words of St. Justin of Chelije that it is a wonder how Montenegro in the last centuries gave the most Saints. "St. Mardarije is from this beautiful village and through his labor he crossed the world and arrived in the heart of the American continent to dedicate it to God, at St. Sava Monastery, which he built in the small town of Libertyville, in a free place on the outskirst of Chicago," said the Bishop. He added that St. Maradije is the descendent of the holy family tree. "His ancestor Mardarije was a bishop here. His earlier ancestors were military leaders, dukes, who fought from the honorable Cross and golden freedom, for faith in Christ and the Serbian name. 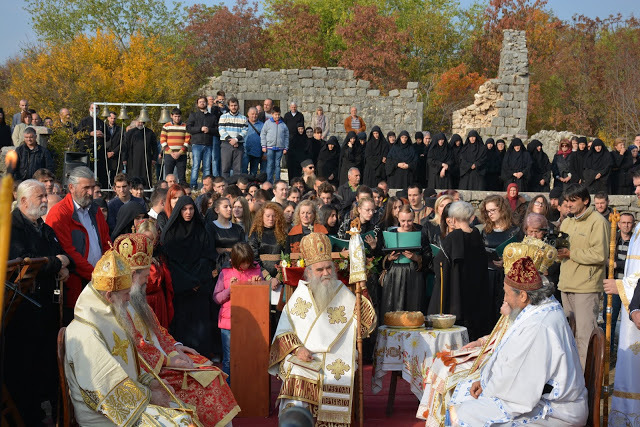 And thanks to God we celebrate here today, at this birth house such a Saint of God," said Bishop Atanasije. After communion and the Slava Kolach in honor of the newly glorified St. Mardarije was cut. Metropolitan Amphilohije said that we, as Serbian Orthodox people of St. Sava are now gifting America and Europe with Saints. "We don't have riches, we have stones and these ancient foundations of our homes and holy shrines, but we have Saints. Nikolaj bloomed in Dachau into a Saint and became a prophet and preacher of repentance to Europe and all of us. But also in America. Our dear, loved America rewards us with bombs, takes Kosovo from us, threatens our being, takes the riches of Kosovo that it might be rich..And with what do we give them back? Our Church, our people gave four Saints to America - St. Varnava of Hvosno, St. Bishop Nikolai, St. Sebastian and St. Mardarije," said Metropolitan of Montnegro and the Coastlands. The bishop said that the Saint with his deeds enriched his birthplace, Russia, Europe and especially America. "Therefore, they give us bombs and we give them Saints. Or, as it's said in the gospels, they give us stones and we give them bread, holy bread, God's bread," said the Metropolitan. At the end of liturgy an agape meal of Chrsitian love was prepared with a spiritual academy with speakers, poets, cultural-artistic groups, guslars, ethno chanters and drama artists.